Dan McCormick had been busy during the winter months, Bruce's pal Bobby Schwartz was signed following his victory in the USA World Championship Round and another young lad from Denmark Erik Gundersen was snatched from under the noses of other teams to add to the growing number of riders on the Heathens books. Dan had a row with the BSPA over the 50 point limit. So his squad of 9 riders went down to 7 with Dave Perks going on loan to Nottingham and Pekka Hautamaki moving to Belle Vue. Carefully shuffling the rest of the riders early on in the season to fit in with the 50 point limit. 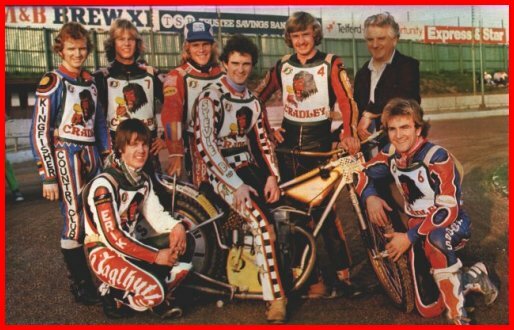 Phil Collins, Erik Gundersen and Bobby Schwartz all missed meetings and were replaced with youngsters John Hack and Denzil Kent. kneeling Erik Gundersen, Phil Collins, On bike - Steve Bastable. Erik was an early season casualty with a broken leg at Wolverhampton in June followed by Kristian Praestbro in July then Steve Bastable was put through the fence at Leicester and broke his ankle. The patched up side lost three vital matches in July which put an end to the Heathens hopes of winning the league in 1979. However Cradley finished third in the League their best position ever just two points behind Hull who themselves were just two points behind winners Coventry. 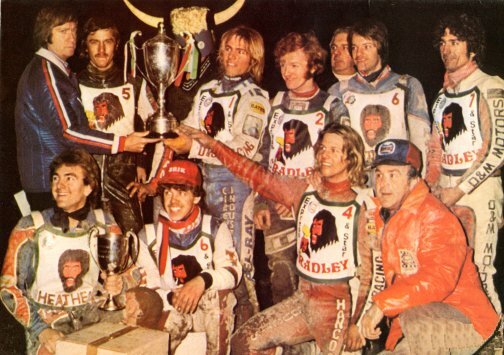 Bruce was appointed skipper when Stevie B was out injured, the blonde Californian continued his climb to fame being voted rider of the year by SWAPA, becoming the second winner of the Master of Speedway and the first American to win the Golden Helmet Match Race Title. He won the World Championship Qualifying Round at Dudley Wood with a 15 point maximum and Badge of Courage Best Pairs with Bobby Schwartz who himself won the prestigious Golden Hammer. Dan McCormick was voted Administrator of the year for the third year running by SWAPA and Bruce was voted 'Overseas Rider of the Year'. 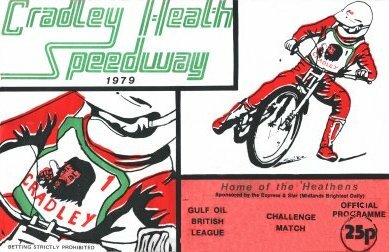 He captained the Heathens to victory both home and away against Hull to take the Speedway KO Cup, becoming the first team to win at Hull in an official fixture since the Viking signed Ivan Mauger. The Heathens lost only one match in the KO Cup by just one point at Wimbledon. Penhall also led the team to victory in the Inter-League Cup both home and away against Kings Lynn, Phil Collins was the star at Saddlebow Road with a 12 point maximum beating Michael Lee and Dave Jessup.The Dudley Wolves Trophy also ended up back in the Heathens Trophy cabinet. One thing marred the 1979 season however, Dan McCormick and Steve Bastable had a bitter row over the composition of the side which resulted in his transfer to Birmingham. The management paid £7000 to Leicester for Ila Teromaa but because he was cup tied Cradley had to use Dave Perks in the KO Cup matches. Dave Perks 5, Steve Bastable 0. Alan Grahame 7, John Hack 2, Dave Perks 2. Erik Gundersen 3, Mike Sampson 0. Dave Perks 6, Les Rumsey 5. Les Rumsey 3, Erik Gundersen 1. Dave Perks 6, Les Rumsey 3. Cradley win 127-89 on aggregate. John Williams 2, Nigel Couzens 0. John Hack 5, Ian Gledhill 2. Kristian Praestbro 4, John Hack 3. John Hack 5, Dave Perks 0. Copyright: Steve Johnson & Cradley Heath Speedway Ltd. 2009.